Plants usually cespitose, sometimes weakly rhizomatous. Culms 30-150 cm, ascending to erect; nodes usually glabrous. Leaves somewhat basally concentrated; sheaths usually glabrous, sometimes markedly retrorsely hirsute or villous; auricles absent or to 1 mm; ligules 0.2-0.8 mm, truncate; blades 2-5(8) mm wide, flat to involute, usually straight and ascending, abaxial surfaces usually smooth and glabrous, sometimes hairy, adaxial surfaces usually glabrous, sometimes conspicuously hairy. Spikes 4-25 cm long, 0.4-1 cm wide, erect, with 1 spikelet at all or most nodes; internodes (4)7-9(12) mm, edges scabrous, both surfaces smooth and glabrous. Spikelets 9-17(20) mm long, usually at least twice as long as the internodes, 3-6 mm wide, appressed, with 3-9 florets, lowest florets functional; rachillas glabrous or hairy, hairs to 0.3 mm; disarticulation above the glumes, beneath each floret. Glumes subequal, 5-17 mm long, from 3/4 as long as to longer than the adjacent lemmas, 1.8-2.3 mm wide, lanceolate to narrowly ovate, widest about midlength, usually green, purple at higher latitudes and elevations, flat or asymmetrically keeled for their full length, 3-7-veined, the keel vein usually scabrous, the others smooth or scabrous, only 1 vein extending to the apex, adaxial surfaces glabrous, margins hyaline or scarious, usually more or less equal, 0.2-0.5 mm wide, widest at or slightly beyond midlength, apices acute to awned, awns to 11 mm; lemmas 6-13 mm, glabrous, usually smooth proximally, often scabridulous distally over the veins, apices acute, usually awned, awns to 40 mm, usually straight, sometimes weakly curved if shorter than 10 mm; paleas subequal to the lemmas, keels straight or slightly outwardly curved below the apices, tapering to the apices, apices truncate, 0.15-0.3 mm wide, keel veins often extending beyond the intercostal region, sometimes forming teeth; anthers (0.8)1.2-2.5(3) mm. 2n = 28. Haplomes StH. 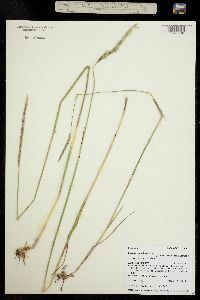 Elymus trachycaulus grows from sea level to 3300 m, usually in open or moderately open areas, but sometimes in forests. Its range extends from the boreal forests of North America east through Canada to Greenland and south into Mexico . It also grows, as an introduction, in Asia and Europe. 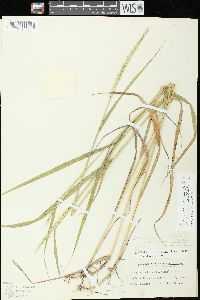 It exhibits considerable variability in the presence or absence of rhizomes, the length and density of the spike, awn development on the glumes and lemmas, and glume venation. The variability in these features has often been used to circumscribe infraspecific taxa, but most such taxa, even though locally distinctive, appear to intergrade. Some of the features appear to be strongly influenced by environmental factors. For instance, plants growing in forested areas of northwestern North America tend to be slightly rhizomatous, more gracile, and later-flowering that those in adjacent, more exposed areas; whether they constitute a distinct taxon or merely a forest ecotype is not clear. 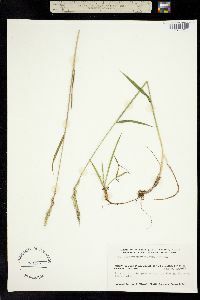 Plants growing at higher elevations tend to have glumes with more widely spaced veins and broader, often unequal margins, resembling E. violaceus -in these respects. Whether this reflects ecotypic differentiation, hybridization with E. violaceus, or greater genetic continuity than is suggested by their placement in different species is not clear. Jozwik (1966) recognized four groups within E. trachycaulus. Group I comprised unawned or shortly awned specimens; group II a polymorphic assemblage of awned specimens; group III a rather homomorphic group of specimens with secund spikes and relatively long awns; and group IV a relatively homomorphic group of unawned, high-elevation specimens. Jozwik concluded that group II consists of hybrids and backcrosses between E. trachycaulus and other species of Triticeae . He based this conclusion on consideration of field observations, artificial hybrids, the polymorphism of the specimens, and the geographic distribution of the group. This last was similar to that of unawned specimens of E. trachycaulus, but the populations were highly scattered within the area concerned. Jozwik-s group III is treated here as Elymus trachycaulus subsp. subsecundus . His group IV is treated here as E. violaceus . 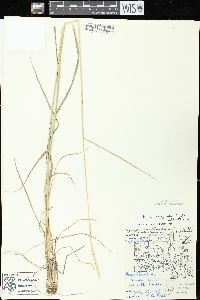 Elymus trachycaulus is often confused with E. stebbinsii . It differs in having shorter anthers, shorter internodes, and glumes that are sometimes awned. 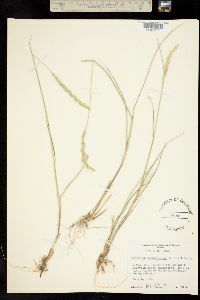 It may also be confused, particularly in the herbarium, with specimens of E. glaucus -having solitary spikelets at all the spike nodes; it usually differs in having shorter anthers and less acuminate glumes. When, as is sometimes the case, the two species grow together, E. trachycaulus can be distinguished by its stiffer leaves. 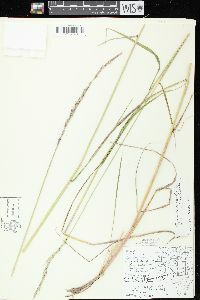 Elymus trachycaulus also resembles E. macrourus -and E. alaskanus , but its glumes are longer relative to the lemmas. It also has less hairy rachillas than most plants of those species. C.L. Hitchcock et al. 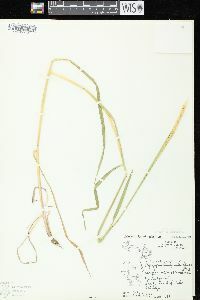 (1969) treated Elymus trachycaulus as a subspecies of E. caninus ; it differs consistently from the latter species in glumes that are glabrous on the adaxial (inner) surface, in a chromosome interchange, and in its molecular characteristics (Sun et al. 1998). It also tends to have a more erect spike. 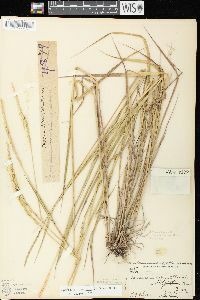 Elymus trachycaulus has been implicated in several interspecific and intergeneric hybrids. 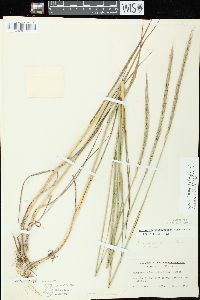 Named interspecific hybrids (and the other parent) are E. -cayouetteorum -(E. canadensis ), E. -palmerensis -(E. sibiricus ), E. -pseudorepens -(E. lanceolatus ), and E. -saundersii -(E. elymoides ). Hybrids withE. 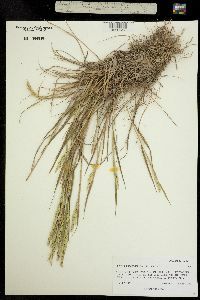 hystrix -have been named -Agroelymus dorei Bowden ; the appropriate combination has not been made in Elymus. 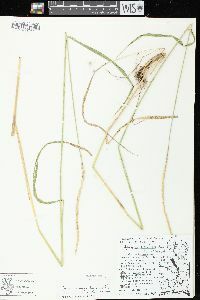 Named intergeneric hybrids are -Elyhordeum macounii -(Hordeum jubatum ), -Elyleymus jamesensis -(Leymus mollis ), and -Elyleymus ontariensis -(Leymus innovatus ). Hybrids with Elymus elymoides , E. multisetus , and Hordeum jubatum -have brittle rachises and tend to be awned. Others are harder to recognize. Tufted, 3-10(-15) dm; lvs usually flat, 2-6(-8) mm wide; scabrous to pilose at least on the upper side; auricles short or none; spikes 4-15(-25) cm, compact, the mostly solitary spikelets 9-16 mm, overlapping, 3-5(-7)-fld, readily disintegrating at maturity; rachilla generally villosulous; glumes lanceolate to oblong-elliptic, acute to short-awned, broad and 5-7-veined, with membranous margins, the first one 6-10 mm, the second 7-12 mm; lemmas 7.5-10(-13) mm, glabrous or scabrous distally and sometimes short-hairy on the margins, awnless or with a straight awn to as much as 3 cm; anthers 1-2 mm; 2n=28. Variable and often divided into several confluent vars. of dubious significance. Various habitats; Nf. 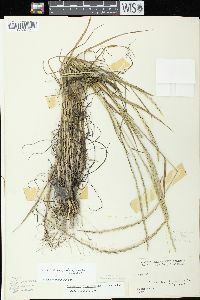 to Alas., s. to W.Va., Ky., Ill., Mo., and Ariz. (Agropyron pauciflorum; A. richardsonii; A. subsecundum; A. tenerum; A. trachycaulum; A. caninum, misapplied) A hybrid with Hordeum jubatum has been called ؅lyhordeum macounii (Vasey) Barkworth & D. R. Dewey.